NAMM 2014 PRESS RELEASE: Studiomaster and Carlsbro are debuting and showing numerous new product ranges at NAMM 2014, where they will occupy their largest ever exhibition stand. The Studiomaster Venture Series is described as an ultra-light, high power, high performance PA series, comprising 12 inch and 15 inch 2-way cabinets, and a matched 18 inch sub; available in both 1000 watt active and passive models. The premium compact speaker series is performance and cost competitive with the best comparable product on the market, and offers best-in-class power to weight specifications; with the 12 and 15 inch active cabinets weighing just 18 and 21.5 kg, respectively. The industrial grade 9-ply cabinets are internally braced and finished in wear-resistant black textured coating, with a steel front grille. A 60° rear bevel enables the 12 and 15 inch cabinets to also be used as stage monitors. The Class-D bi-amplified active cabs deliver a total of 600 watts rms power to the bass and HF drivers, with a peak system power rating of 1000 watts. All principal components - drivers, cabinet and integrated electronics - were designed specifically and matched meticulously for the Venture project. 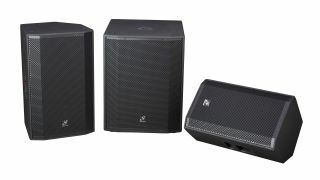 The resultant performance and sound quality has exceeded design expectations, with a smooth frequency response and highly accurate crossover points, and the ability to deliver that sound quality at high SPLs, in excess of 130dB. Studiomaster Director of R&D, Paul Belcher, states, "The performance and quality of the Venture Series matches any 1000 watt compact PA speaker currently available, and at a very competitive price. We engaged in a long testing programme in developing the final design, and the resultant performance of the range has far exceeded our original design objectives. The sound quality is exceptional for a compact, light weight cabinet. "As a premium range product, the Venture cabs are a perfect system match for our new Horizon mixer range. The availability of both the speakers and the mixers in powered and passive models offers a wide range of system options for professional quality, small and medium scale fixed and portable reinforcement systems for all manner of applications." A high efficiency switch-mode power supply provides ample reserve power for the class D amplifiers, ensuring their optimum performance; the amplifiers and power supply are a high efficiency design requiring no cooling fans. Neodymium magnets are used in all drivers in the active cabinets and the 1 inch HF compression drivers feature a light alloy diaphragm and copper clad aluminium voice coil. The active cabinets feature a 2-channel rear panel mixer section; one channel with balanced XLR mic and ¼ inch jack line inputs and the other with balanced XLR and stereo phono line level inputs. An XLR LINK line level output enables connection of additional speaker cabinets. There are master level and channel level controls, and green power-on and red peak LEDs. The 18SA sub features a balanced XLR input, a 100Hz hi pass filtered XLR output (to the mid/high cab) and XLR LINK output. Pole mount and M10 hanging fixings, and fully recessed professional carry handles are all included. The passive cabinets feature the same high quality construction and sound performance characteristics, and are rated at 800 watts program and 1600 watts peak power handling. Connectivity is with Speakon NL4 connectors throughout. Two other major new Studiomaster product series at NAMM are the final production versions of the Horizon powered and passive professional portable mixers and the unique Starlight combined stage-sound and lighting cabinets. Commenting on the significance of these three major product series, International Business Development, Sales and Marketing Director, Paul Brewis, states, "We are delighted with the new Venture Series and, like Horizon and Starlight, it goes to show our design intentions moving forward, with truly outstanding quality product. With the prevalence of homogeneous plastic product in the powered mixer category, Horizon really sets itself apart: in terms of appearance - with its aluminium and bamboo construction - design, build and sound quality, power rating, and truly useable onboard effects. Yet it is exceptionally light weight and portable, and price competitive with lesser quality product. The Starlight sound and lighting cabinets illustrates the innovative genius of our UK based R&D team in creating a whole new product category for the MI and audio installation market."